Will Public Shaming Discourage DUI Drivers? Although some arrests for DUI in Los Angeles get big play in the media—especially if there’s some celebrity or prominent politician involved—most drivers manage to keep their incidents fairly private. A legislator in Mississippi wants to take the concept of public shaming of DUI drivers to another level. State Representative Gary Chism plans to introduce legislation that will require anyone convicted of DUI for a second time to install a special yellow license plate—with bright red letters—on their vehicle. He calls it a “Scarlet Letter Tag.” The cars would have to carry this special license for a year. 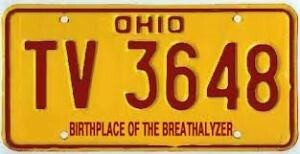 Ohio already has a similar law, passed in 2014, that requires second, third and fourth time DUI offenders to have a yellow license plate with red lettering on their vehicles for as long as their license suspension lasts. Although multiple DUI offenders in California may not face the ignominy of a “Scarlet Letter” license tag, they do pay higher penalties than those convicted of DUI for the first time. California Vehicle Code 23542 calls for imprisonment in jail from 10 to 364 days, a fine of anywhere from $390 to $2,000 and a license suspension of two years.